Paint is any liquid, liquefiable, or mastic composition which, after application to a substrate in a thin layer, is converted to a solid film. It is most commonly used to protect, color or provide texture to objects. In 2011, South African archeologists reported finding a 100,000-year-old human-made ochre-based mixture which could have been used like paint. Cave paintings drawn with red or yellow ochre, hematite, manganese oxide, and charcoal may have been made by early Homo sapiens as long as 40,000 years ago. Pliny mentions some painted ceilings in his day in the town of Ardea, which had been done prior to the foundation of Rome. He expresses great surprise and admiration at their freshness, after the lapse of so many centuries. Paint was made with the yolk of eggs and therefore, the substance would harden and adhere to the surface it was applied to. 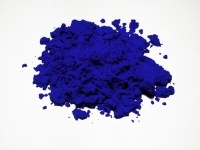 Pigment was made from plants, sand, and different soils. Most paints used either oil or water as a base. A still extant example of 17th-century house oil painting is Ham House in Surrey, England, where a primer was used along with several undercoats and an elaborate decorative overcoat; the pigment and oil mixture would have been ground into a paste with a mortar and pestle. The process was done by hand by the painters and exposed them to lead poisoning due to the white-lead powder. One Pound of Colour ground in a Horse-Mill will paint twelve Yards of Work, whereas Colour ground any other Way, will not do half that Quantity. By the proper onset of the Industrial Revolution, paint was being ground in steam-powered mills and an alternative to lead-based pigments was found in a white derivative of zinc oxide. Interior house painting increasingly became the norm as the 19th century progressed, both for decorative reasons and because the paint was effective in preventing the walls rotting from damp. Linseed oil was also increasingly used as an inexpensive binder. In 1866, Sherwin-Williams in the United States opened as a large paint-maker and invented a paint that could be used from the tin without preparation. It was not until the stimulus of World War II created a shortage of linseed oil in the supply markets that artificial resins, or alkyds, were invented. Cheap and easy to make, they also held the color well and lasted for a long time. Unless indicated otherwise, the text in this article is either based on Wikipedia article "Paint" or another language Wikipedia page thereof used under the terms of the GNU Free Documentation License; or on original research by Jahsonic and friends. See Art and Popular Culture's copyright notice. This page was last modified 09:23, 10 November 2014.